My son wanted a Bakugan cake for his 9th Birthday. I looked on every site and couldn’t find any type of Bakugan cake, since they are so new. I made a basic 1/2 sheet cake with buttercream icing. I used tip 12 (I believe) to do the ball trim around the cake. Wilton decorating spray was used instead of tinting all of the icing. This method took a lot less time, but be careful because it will run and drip just like spray paint if you use to much. You can buy the figures as a set in any toy dept. I copied and laminated the Bakugan cards instead of using my son’s real ones. This way they aren’t damaged and you can just throw them away when you are done. This cake was a huge hit, especially because you can’t find a Bakugan cake anywhere, yet. Thanks for the color idea because I had this same idea with the toy figurine. I wasn’t sure how to do the colors but this definitely help me! My son is having a Bakugan Battle party so this finishes the last detail for me! My son wants this theme for his 8th b-day party. Question for Yvonne – how/what did you do for a bakugan battle party? Please share details because I have no idea how to facilitate this. A friend of mine used foam board that you can get at any craft store or Wal-mart for the game board. If you have the battle arena, then you can use that of course. However, with the foam board you can have multiple battles going. In each corner she had a rule book and a picture of the characters. You can use the ones from the toy packaging or copy the cards if you want. Then you pair up the kids and set a timer for 10 minutes. When the timer goes off, the kids trade places and battle the next person. You can rotate however you want depending on how many kids you have. The kids can keep score as to how many times they win and then the biggest winner gets a special prize, bakugan cards or a bakugan whatever you decide. To keep everyone’s bakugan straight, give each child a plastic bag with their name on it and they can keep their battle items in that bag as they rotate. The prize is a great idea for a birthday party but you don’t have to do that if you don’t want to. My plan is to have this in my garage with a long table and to have snack foods for the party! I am also limiting the number of kids because I think it would be too crazy with a large group of kids, our limit is 6. Hope this helps! Good Luck! Thanks for the great cake idea. My son is crazy about Bakugan and wanted that as his birthday theme. Your cake has started my decorating ideas going. Thanks for this. I will definitely use this for my son’s birthday cake. Any ideas for the Bakugan balloons or pinata? 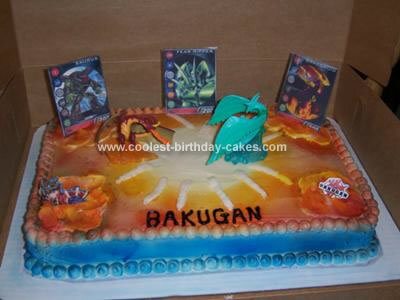 My son wants a Bakugan cake for his 8th birthday, and you are right there is nothing out there! Thank you for posting your cake it looks great, I will be making the same one for my son’s birthday! Thank you! Thanks to all of you for the kind comments. I am glad to have helped by posting this cake! My son also wants a Bakugan party for his 8th birthday. My problem isn’t the cake it’s the rest of the decorations. Any helpful advice? I’m also on a very tight budget right now I just had a baby. Your cake looks great! My nine year old son wants a Bakugan birthday party too. I am also searching online for a pinata if anyone know where I can get one I would appreciate it. Thanks and everyone have a great day!! That is a great idea! I might like to try for my son’s birthday! My stepson has asked for a Bakugan cake for his birthday in August. I REALLY like the idea of laminating the cards to put on the cake! Thanks! Thanks so much for sharing your great idea! I am making this for my son’s 5th b-day party!! Hey Crystal- I also thought of doing a sphere cake for my son’s b’day. How did yours come out? Do you have any pics? thanks. Thank you so much for taking the time to put the cake online! I have been stressing over this! I originally wanted to make a cake in the sphere shape, but I am chickening out. So, your cake came at the perfect time. Your Bakugan Cake is AWESOME!!! You did an amazing job. Your right no Bakugan Cakes out yet and so I said let me get the coolest picture I can find, scan it and put it on edible paper to place on top of a cake along with some Bakugans. My son wants one for his party. i would like if you can make me one for my 11 year old son’s birthday party asap. The party is Feb. 20, at 3:30 so if you can please get back with me at (414)736-2985 thank you. I have looked all over for a Bakugan cake. This is such a great idea. Seems pretty easy too. My son’s b-day is 3/26/10 turning 11. He is going to love it. Thanks again for sharing. My son just turned 9 and wanted a Bakugan cake. He had a few ideas of what he wanted but they sounded next to impossible. I looked on the internet and found your idea right away. This cake was easy and went together so well! LOVED the spray “tint” by Wilton to color the frosting. I cut a “star” shape similar to what you had in the middle (kind of like the white part on the back of a Bakugan card) and laid that on the top of the cake while I sprayed yellow and then red to leave a white star when I removed the paper. I piped a big “9” in the middle of the white and then wrote Happy Birthday and his name across the bottom of the cake (all in black). He LOVED his cake. Thanks so much for sharing! !